I had received some complimentary coupons from the folks at Redwood Hill Farm for their delicious goat milk products and got to thinking what I could make with them. So I took Walker and Alistaire shopping at the new Fred Meyer store in town as I knew they carried some of the line. I ended up giving a coupon or two to a lady I got chatting with in the natural foods section. She had never had goat yogurt (or knew it was made). Hope she likes it! We got yogurt in a several flavors, plain and plain kefir as well. The flavored yogurts are thick and creamy, with fruit at the bottom. Frozen yogurt sounded delicious and I know The Toddler always enjoys it! Thinking goat milk sounds odd? Try it! It is different in a good way. 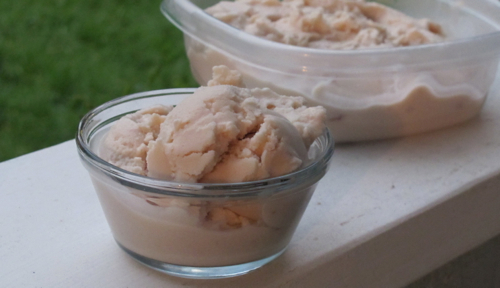 The fro-yo takes only a few minutes to stir together and 25 minutes in the ice cream maker. No cooking, no fussing. And yes, it is real fro-yo, with everything healthy present! Unlike many frozen fro-yo’s in the store that are really ice cream. My version is both sweet and sour, if you like less sour yogurt flavor, add more maple syrup, up to double. Yum….. Transfer to a container or two, freeze until firm (about an extra hour or two). Store tightly covered in the freezer. Hide from toddlers…. FTC Disclaimer: We received the product for use in recipe development and potential review.